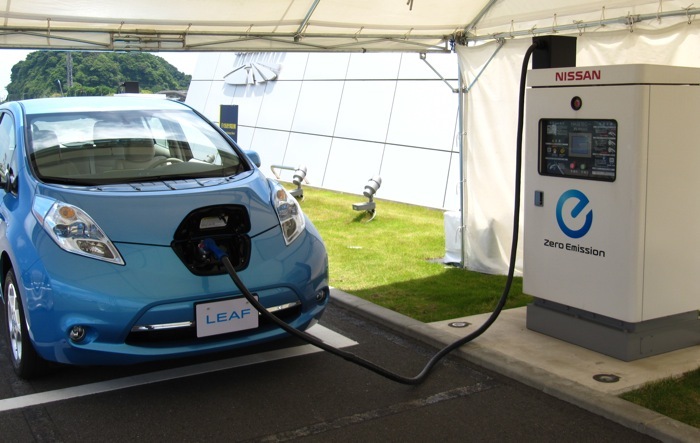 Ten Japanese companies said Monday they plan to install electric vehicle chargers at the sites of beverage vending machines across Japan in a cost-cutting tie-up. The consortium includes Forking Co., a major vending machine operator, and Panasonic Electric Works which will develop and produce electric vehicle chargers with rivals. Forking has business ties with companies which own a combined 1.2 million vending machines across Japan, or about a half of the national total, company official Reiko Kobayashi said. The firms plan to install some 10,000 electric vehicle chargers at the sites of the vending machines in the first year of the project, which is due to start at the end of March, she added. Charging machines "will be installed where beverage vending machines already exist or together with new ones. There are various options," she said. SoftBank Telecom and SoftBank Mobile are due to provide telecom services to connect the charging systems, the group said in a press release.